The Cozy Collection geometrics range from sophisticated mathematical designs to tribal to a relaxed country kitchen look. The unifying theme is provided by the colors and relaxed mood. Tan Mexican Style Geometric printed on quilting cotton is a timeless design. Cozy Digital Mosaic is an intricate orange mathematical design. Printed on quilting cotton. 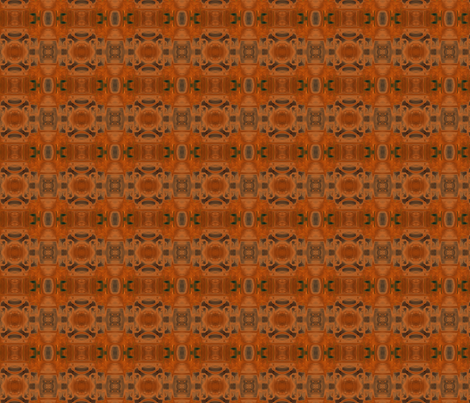 Cozy Digital Mosaic 2 fabric is an orange and dark brown digital design. Printed on quilting cotton. Green Pinwheel on Orange is a design with a relaxed country kitchen mood. Printed on quilting cotton. Tribal Geometric in Gold and Blue is a vibrant fabric. Printed on quilting cotton.